This election cycle has revealed America’s discontent with government, and, increasingly, winning primary elections means candidates must creep further away from center, appealing to voters on the extremes. 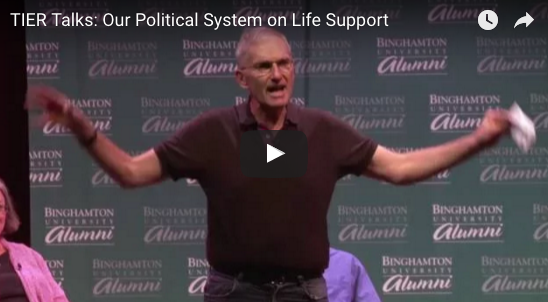 For Binghamton University’s TIER Talks: Our Political System on Life Support, we explore the health of our political system through a series of lectures. David Schultz, professor of political science at Hamline University, discusses polarization in politics. Matthew Kerbel, professor and chair of political science at Villanova University, shows us how traditional and online media are used in politics today. Dr. Jean W. Harris, professor of political science and women’s studies at University of Scranton, gives her talk on career politicians. TIER Talks was recorded on Sept. 24 at the Watters Theater by James Graham. Jake Zall ran sound.